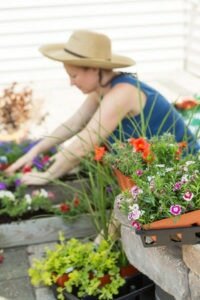 Getting out in the garden is definitely an awesome way to spend a sunny afternoon or a weekend but many people don’t realize the health benefits of gardening. Stepping out into the fresh air and really getting back to nature can bring you so many good things and really change your entire outlook on life. It sounds drastic, but I’m not kidding! There are few things better in life than the simple pleasure of enjoying your own carefully cultivated patch of earth – no matter how big or small. So I’ve put together some awesome information about the physical and mental health benefits of gardening. Some of us just aren’t cut out for spending hours in the gym, am I right? It can’t JUST be me! If the thought of pounding a treadmill for hours on end while listening to pop music at a high volume just doesn’t do it for you, then you may be happy to learn you can get a good workout just from gardening. Yeah, I know, right? The physical benefits of gardening are easy to see. Have you ever noticed how people who work outdoors have a generally a toned physique and find it easier to keep trim than others? Even just a small amount of lifting, walking, and bending can help to improve your overall health. You might not realize it, but walking up and down a garden is good exercise. If you’re pushing a mower or using a rake to gather leaves, it is gently working your muscles as well as providing a great cardio workout. Pushing a wheelbarrow is also good strength training – depending on the weight of the load! And all that bending down you’re doing while weeding the flowerbeds or scraping moss from surfaces is also giving your body a good all over workout. Don’t believe me? Just try it once, you’ll be feeling it for days. 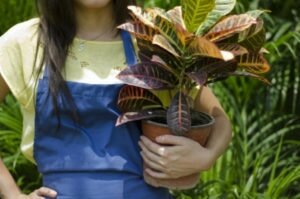 Carrying plant pots, while improving your upper body strength, arm, and shoulder muscles is also great for your core. While holding a heavy load your core muscles “switch on” to help you stay balanced. You Can Burn Calories, too! You might be surprised to learn that just mowing the lawn burns up to 350 calories an hour and if you throw in some weeding and planting you could lose another 400. So forget that gym membership and head outside for free! Lifting, pulling, carrying, all these exercises use your hands and will improve your strength. 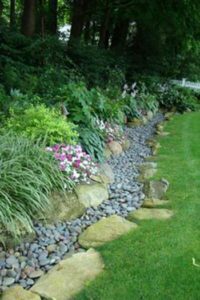 Carrying large rocks to set in a dry creek, for example, will strengthen your hands and give you better grip if they are irregular shaped. Pulling weeds requires a level of dexterity and will improve your grip. 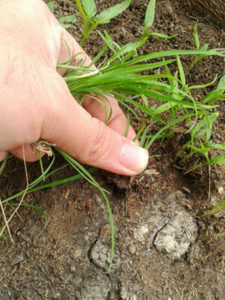 Grabbing onto those stubborn weeds and getting them out of your flowerbeds might seem like a chore but bear in mind how it is improving your hands and it will seem less of a task. Just make sure to wear gloves! 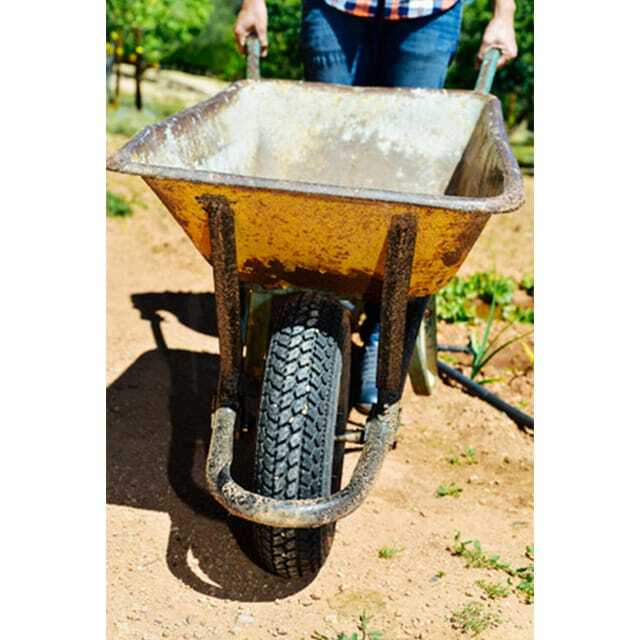 Even lifting a wheelbarrow will improve your grip, hanging onto the handles will give you greater strength in your hands as well as your lower arms. If you struggle with opening jars or other tasks around the home then a few hours gardening a week could easily improve your grip strength and make everyday chores seem easier! 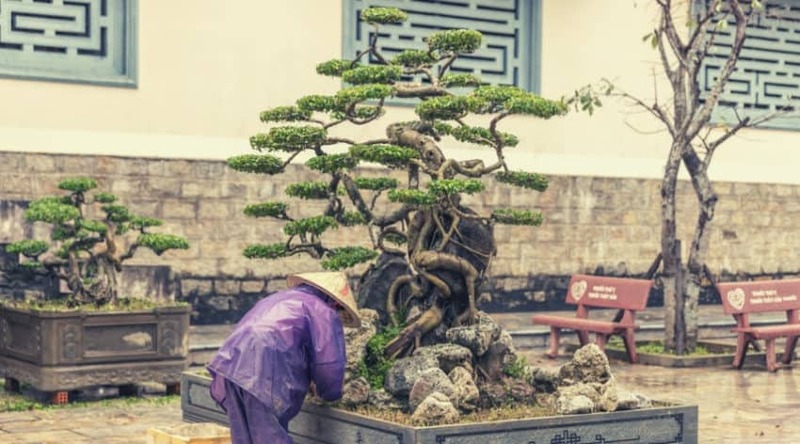 If you struggle with your health, seated exercises like repotting plants or planting seeds in seedling trays will still help and fiddling with small plants or tiny seeds will definitely improve your dexterity. As well as the tried and tested advice doctors give about eating the right food and avoiding smoking and alcohol, another way to keep your heart healthy and make sure you are fighting fit is by gardening. Experts say just ten minutes of an activity that leaves you out of breath, once a day, can strengthen your heart and guard against high blood pressure and cholesterol. 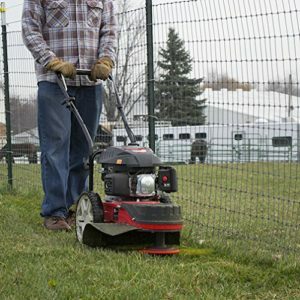 Just getting outside and pushing the mower or trimming the edges in and around your garden can help you keep your heart strong and healthy. Far from running or cycling, physical activity can be something as simple as 30 minutes cutting back a hedge or an hour of weeding the path. Gardening can really help to keep you active both physically and mentally. 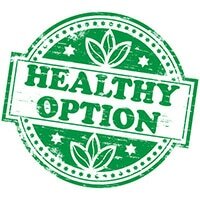 If you’re a foodie, or even if you’re not, home grown fruit and vegetables have something extra about it that just makes it taste better than anything bought from the supermarket, plus the added health benefits of organic. The freshness of being able to pick it out of the ground then wash and serve immediately cannot be beaten. 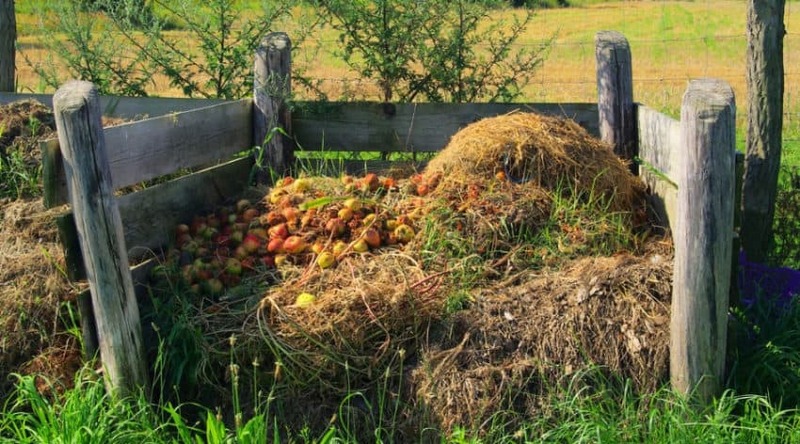 Of course, if you’re just looking for organic food and not looking to put in the work you can always buy organic. 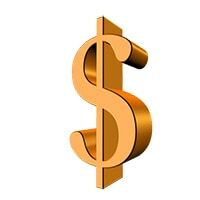 It can be pricey, but there are a few options out there that can help you save money. 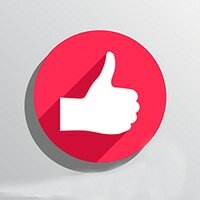 There are plenty of reviews on Thrive Market, and it comes highly recommended. In the summer, juicy strawberries are easily grown in a pot and for those with limited space think about climbing plants such as tomatoes to really make the most of your space. 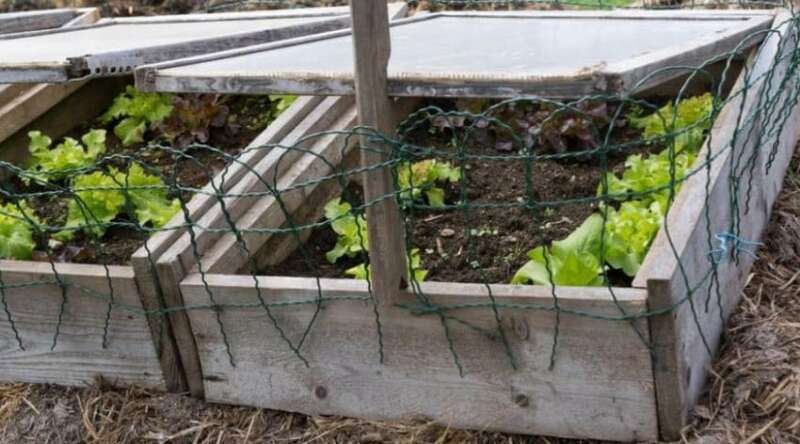 For the luckier ones who have much more garden to play with, think about putting in some raised beds to make harvesting your crop easier or, if you’re really feeling adventurous, invest in a small greenhouse to hatch seedlings or grow fruit likes grapes. Herbs and salads can be grown quite easily on a windowsill – and they’re easy to reach from the kitchen while cooking! We all remember growing simple plants at school in Biology class, and these fail safe plants will make sure you have extras to flavor your recipes without having to make a trip to the shop. 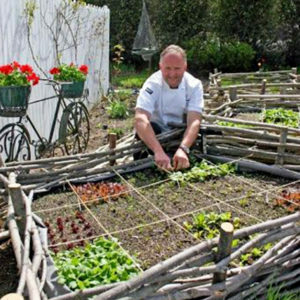 Growing your own food can also help if you’re on a tight budget. Potatoes, beans, and onions can all be grown very easily – and cheaply – year round. 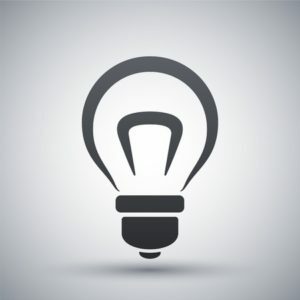 There’s loads of help and advice out there to help you get started. I know, it sounds wrong! But it is a fact that exposing yourself to dirt and germs (a limited number!) 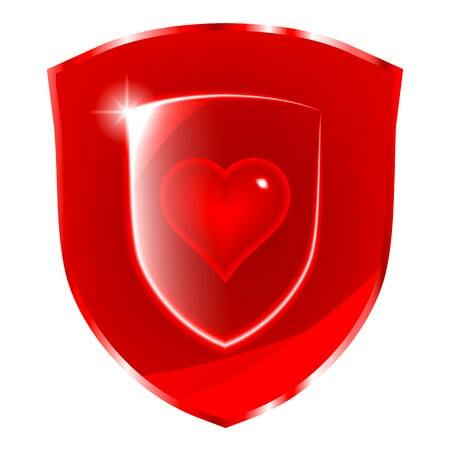 can actually help you build an immune system and protect against harmful diseases later in life. You’ll also get up close with some good bacteria. 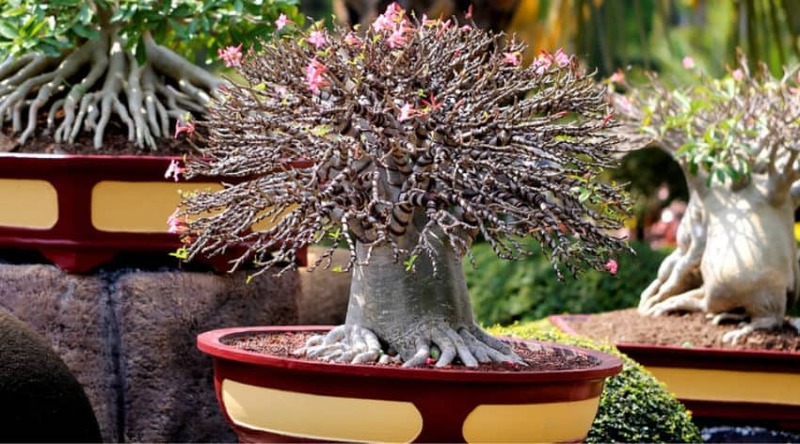 There are even studies which say gardening and getting contact with this bacteria elevates mood and decreases anxiety. Unbelievable as it may sound, there are even some scientists who believe playing in the mud can be as effective as antidepressants for improving your mood. This theory is known as the “hygiene hypothesis” and claims exposure to bacteria found in your average backyard could not only boost our immune systems but help us stave off the debilitating symptoms of depression. A lot of experts believe over cleaning and sanitizing things is actually leading people to have poor health. 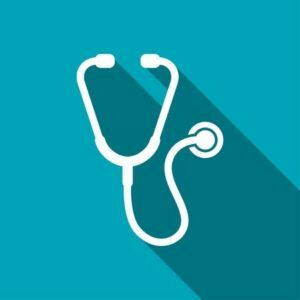 It sounds wrong, but think about it: if you don’t ever get exposed to tiny amounts of relatively harmless bacteria, your body won’t develop the tools it needs to fight off a big infection. So next time you head out into the garden, leave the hand sanitizer indoors and really get back to nature! We all rush outside when the sun comes out and want to soak up as much as possible, but getting out into the daylight even when it is overcast is just as important. The sun’s rays give us vital Vitamin D.
It is so important for our overall health, psychological as well as physical, that we absorb as much Vitamin D as we can. This doesn’t mean running out into the sun without any sunscreen on! 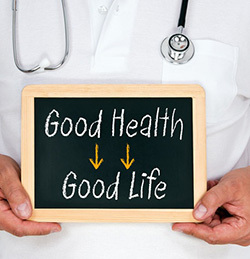 But getting out and about can have incredible health benefits. 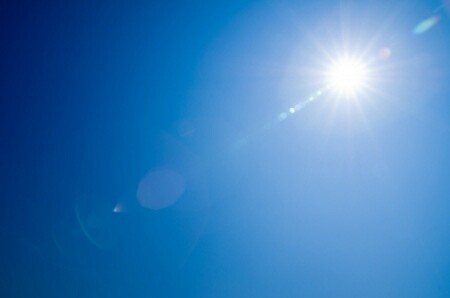 In fact, we actually need sunlight to prevent a wide range of diseases and health problems. So why do we need vitamin D? In short, we rely on Vitamin D to make sure we absorb calcium – essential for strong bones – and boosts your immune system. 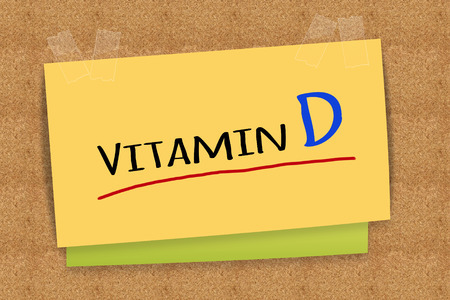 Mentally, Vitamin D can alleviate symptoms of anxiety or depression. Obviously, you should be aware of the dangers of sunburn and heatstroke but if you are careful and make sure you are getting enough sun without putting yourself at risk you will see the powerful results almost immediately. So get outside, whatever the weather, and enjoy the daylight as much as you can while tending to your garden. As well as protecting against colds and flu, gardening could also help you stave off allergies. 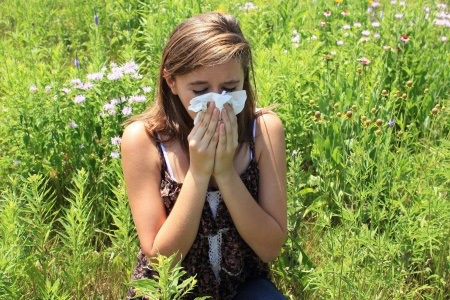 I know it sounds backward to get closer to plants and flowers if you suffer from hay fever for example, but some research has shown when children are exposed to pollen from a young age they may build a resistance. But if you’re still suffering in the garden, take a look at this allergy friendly gardening advice. Asthma can prevent you from doing strenuous exercise like running or cycling but light exercise like gardening will tone your muscles and help you lose weight gently – without putting too much strain on your lungs. In cold weather, asthma can flare up so take precautions like covering your mouth with a scarf to help warm the air you breathe in and take your medicine before venturing outside to make sure you are protected from the outset. Some people suffer from summer-induced asthma – where the condition can be triggered by pollen or grass. Pretty miserable, huh? But there are some things you can do to help get outside in the garden even if you do suffer from asthma. Look at the pollen count index, some days will be very high and it is best to avoid the garden then but on lower days, for example after rain, you should suffer less. To limit symptoms, you can also shower and change your clothes when you come in from a day in the garden. This will get rid of the pollen and help reduce the amount you breathe in. If you suffer from severe allergies or asthma, you could consider creating an allergy free garden. If you’re unlucky enough to have suffered ill health which has affected your coordination, or even had a stroke, you may find you’ve lost strength and coordination in your limbs. This is where gardening can be used to rehabilitate. 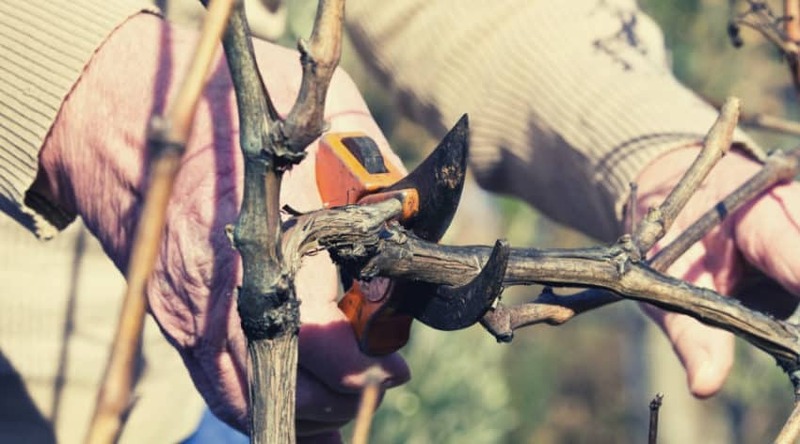 Simple tasks like weed wacking or even the act of holding a pair of pruning shears to clip back a bush can help you get back hand eye co-ordination. The simple, repetitive tasks will retrain your muscles and get the signals in your brain firing as they should. The advice is to do as much of the physical labor yourself in short periods of ten minutes or so. If you need a wheelchair, raised beds and flat paths can help you get outside and continue to do small garden tasks easily. There is plenty of evidence to back this up. So if you’ve lost your ability to get out in the garden due to ill health, it is worth seeing if a few simple tasks will help you get back outdoors. The calming effects of gardening are not something everyone thinks about. But the psychological and emotional benefits of gardening are clear to see. Working in a garden can give you a sense of purpose, a project to focus on and something to be proud of. There are numerous charities set up to help people with mental health problems overcome them with the help of a plot of land. Gardening as a stress reliever is very effective. The physical exertion coupled with the focus you need on the task at hand can mean your daily worries melt away and your blood pressure reduces. Just getting out in the garden for an hour after a long and stressful day at work can help to put things in perspective and allow you to switch off. For people suffering from depression, getting outside has innumerable benefits. As we mentioned above, just exposure to the Vitamin D in sunlight has a proven effect but the ownership and sense of purpose gardening give you is just as important in helping to stave off depressive thoughts and feelings. 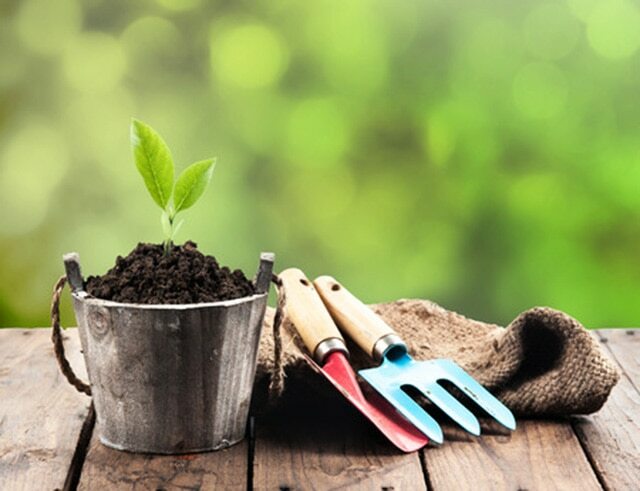 Taking on a gardening project and setting little milestones or goals along the way, will help you focus on a new facet of your life. After a bereavement, job loss or setback in life, gardening can help you to regain a sense of control and allow you to get back on your feet. 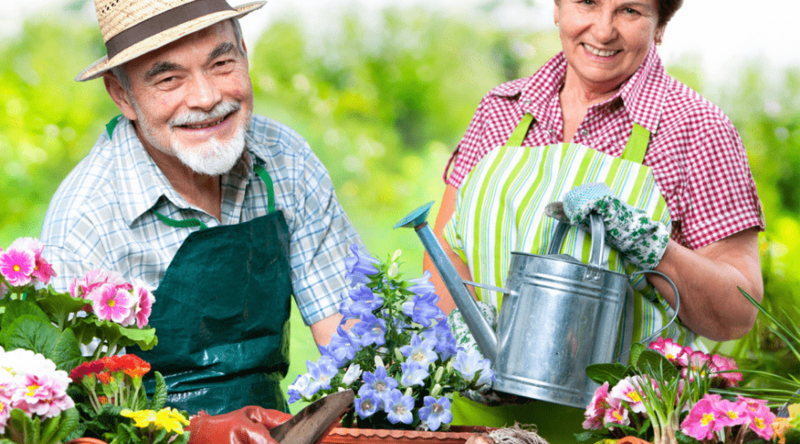 The therapeutic effect of gardening has also been held up as helpful to patients with Alzheimer’s or dementia. As well as giving yourself somewhere that looks lovely to sit and enjoy, gardening can slow the progress of the disease by helping to retain motor skills. It is also just great to be outside soaking up the sounds, smells and atmosphere of your little haven! Having a well-tended garden is more than just having a place to show off to the neighbors! The benefits of plants and flowers can be physical and mental but by cultivating your plot you are also helping to improve the environment. 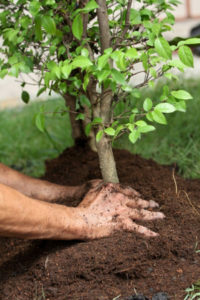 Planting trees helps clean the air – particularly useful if you are living in a large town or city. On average, two mature trees produce the same amount of oxygen used by a family of four. With a big enough garden and a bit of planning, you could try to offset your family’s carbon emissions just through planting trees which produce lots of oxygen. Trees and plants also take harmful C02 from the air which prevents global warming. Who wouldn’t want to live in their own tree-surrounded garden bubble? These are just some of the benefits of plants in your garden, they are also helpful for soaking up water so in times of strong rainfall your garden is less likely to flood. Bushes and shrubs can help screen off neighbor’s gardens and give you more privacy while also helping to deaden noise so you can create a peaceful oasis – even if you’re in the middle of a city! If you have a coastal property, plants and trees can also be really handy to stop erosion. Their root systems form strong foundations keeping the land together for years to come. You can find out more about Clean Air Gardening here. Planting a beautiful garden and caring for it will actually see you save and even make money – really! The most obvious way to save money is to create and cultivate a healthy vegetable patch. No more trips to the supermarket for expensive (and usually imported) fruit and vegetables. By concentrating on growing your own food, not only will you be eating better, more seasonal foods without the added pesticides but you will also save cash. It’s a win-win! We know that after you’ve spent the time and effort converting your uninspiring patch into a haven of tropical plants and stunning flowers you might not want to leave – but if you did you could reap the benefits. 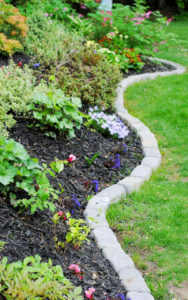 In fact, one study says you can see up to 7% more value on your home if the garden is well tended. Having a well-manicured lawn and planted beds attracts homebuyers who may be willing to pay more money for the added extra of a cared for garden. 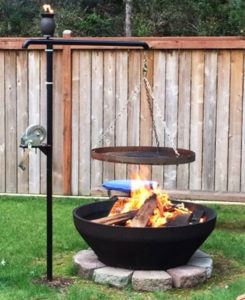 The addition of decking, a brick built BBQ or even the luxury of a great DIY fire pit may seem extravagant but you will see that investment back when you come to sell. Even if you’re not going to go wild and turn your garden into a playground, just a well looked after plot with a variety of interesting and pretty plants will still see you get ahead of the competition on the housing market. Plus, a well-designed landscape can help cool your home during the warmer months by providing extra shade. Whether you’ve got acres of land at your disposal or just a small courtyard behind a terraced house, planning is key to getting the best from your garden. Look at what features you have that you can incorporate into the overall design. Do you have a wall or fence you could climb ivy up? Is there room for pots to add herbs and scented plants into the mix? 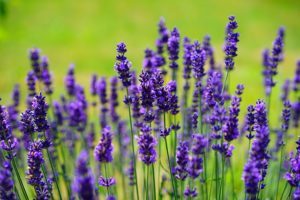 In small gardens, the addition of fragrant plants like lavender or jasmine can really transform the whole area and give it a countryside feel without needing the space. Try to position these plants near the entrance to your garden so every time you step outside you are met with a waft of summer fragrance. 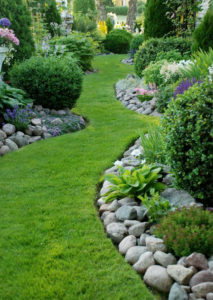 In larger gardens, consider breaking up the block of land into smaller segments. 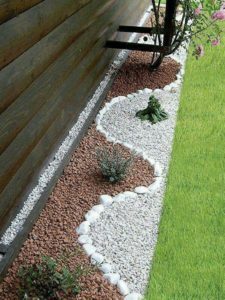 Perhaps leave one area to go wild with native flora and fauna while also laying a winding path through to create a fairytale forest feel. And create another area purely for entertaining with a dining set, decking, and a BBQ. Set goals for yourself. If your garden has become overgrown or it is feeling a bit unloved, it is easy to become overwhelmed with the sheer scale of work needed to bring it back up to a usable state. Before you rush in head first, sit down and work out what it is you want to achieve. 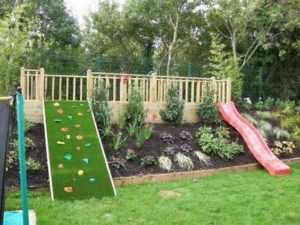 Do you want to use the garden for entertaining or is it mainly a playground for the kids? Once you have your vision, break down the jobs into small manageable tasks. Not only will this help you get it all into perspective it should make each job easier to achieve. But the single most important thing to get the most out of your garden is… use it! Whether it is raining or sunny, cold or the hottest day of the year, there are always little jobs to be done in the garden. So get out there and enjoy! So there you have it. I hope you’ve enjoyed reading about the physical and mental health benefits of gardening and are looking forward to putting some of it into practice. There are truly amazing upsides from just pottering around in the garden – both physical and mental. I hope you’ll get as much out of your garden as I do. 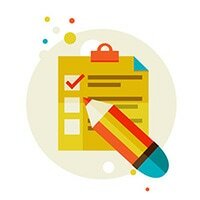 We really appreciate your feedback so please leave comments underneath to let us know how we did and share this advice with your friends – you never know who might need it. When Should You Fertilize Your Lawn?